Born in Montreal and raised in Ontario by British parents awed by Canada's wilderness, my childhood love of wildlife was kick started into a career by a lucky park ranger job in Hudson Bay when I was 18. I've conducted research on wildlife from songbirds to bears, focusing on wolves and their ungulate prey across Canada, the US, eastern Europe and Mongolia. My main research objectives are to always combine strong empirical approaches to the conservation of terrestrial wildlife and the systems in which they live — to me, large ungulates and their predators are good entry points to understanding ecosystems because of their important roles and their conservation and management relevance. I love running, mountain biking, hiking, walks with my wife Emily, my 4-year old daughter, Anna, our newborn boy, Simon, and our dog, Koda, a poorly trained Husky. From Cleveland, Ohio, Matt moved to Montana to attend the University of Montana where he obtained his B.S. in Wildlife Biology in 2001. Since then, Matt has spent most of his time in Yellowstone National Park studying wolf-prey dynamics. During this time, he received a MS at Michigan Technological University studying seasonal dynamics of wolf predation in Yellowstone. His PhD research is also in Yellowstone and examines how spatial and temporal variation in wolf predation influences predator-prey population dynamics. Besides studying predation dynamics, Matt enjoys hiking, skiing, snowboarding, playing recreational sports, and, most especially, watching Ohio State and Cleveland Browns football. Eric grew up in Oregon and developed an interest in ecology while hiking in the Cascade Range and during summer vacations to Missouri and Michigan. After completing his undergraduate degree in Colorado, he worked for the US Geological Survey in California studying waterfowl ecology and migration throughout western North America, Asia and Africa. Eric moved to Vancouver, BC for his MSc research, which focused on trophic, energetic, and physiological responses of wintering sea ducks to habitat variation. After years of studying waterfowl, Eric is entering the world of ungulate ecology. His current research uses remote sensing and GPS collar data to build movement and habitat selection models for caribou as part of NASA’s Arctic Boreal Vulnerability Experiment (ABoVE) project. Hans was born and raised in Sturgeon Bay, Wisconsin and completed a degree in Wildlife Ecology from the University of Wisconsin-Madison. As an undergraduate he worked as a fisheries technician and bird surveyor, but his first job out of undergraduate was trapping wolves in Northern Minnesota. He then worked for the Yellowstone Wolf Project and completed a Master’s Degree from the University of Minnesota-Twin Cities where he studied wolf-elk encounter rates in Yellowstone National Park. At the University of Minnesota he was advised by David Mech was part of the Fieberg quantitative ecology lab. 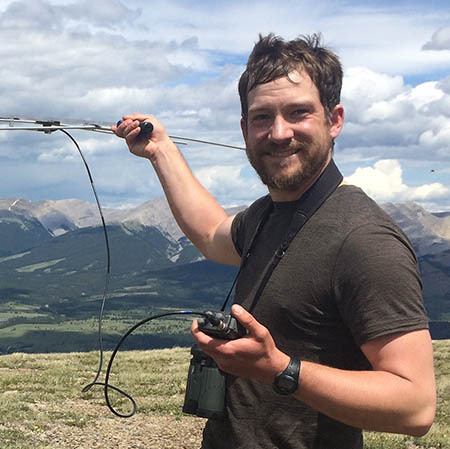 Hans Martin started his PhD in the Hebblewhite lab in the fall of 2017 and is studying the effects of facultative switching between migrant and resident strategies in the partially migratory elk population in the Ya Ha Tinda located to the east of Banff National Park (check out the Ya Ha Tinda Long-Term Elk Monitoring project web site). He enjoys fly fishing, camping, hiking, and bowhunting and when not in the office, can be found on the rivers or in the mountains around Missoula. Libby grew up in Minnesota but ventured east to complete her BSc in Animal Sciences with a minor in Wildlife Biology from the University of Vermont in 2002. She spent 5 years working full time as a veterinary technician and part time as science teacher at the Ocean Institute in Dana Point, CA where she met her husband Nick. 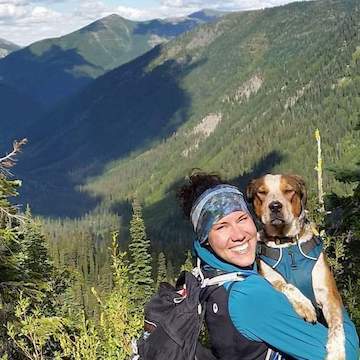 They moved to Montana, spent 3 years working as a biological technicians in Yellowstone National Park and then moved to northern British Columbia to pursue their master degrees. While at the UNBC, Libby’s research focused on the effects of large-scale industrial development on predator-prey dynamics with Dr. Chris Johnson. In 2012, Libby moved to San Diego, CA where she spent the last 5 years working as a program manager for the talented Marine Mammal & Turtle Division at the Southwest Fisheries Science Center (NOAA/NMFS). Libby’s PhD research will focus on the nutritional, spatial and population ecology of the Fortymile caribou herd in Alaska/Yukon; this research is also part of a collaborative study with NASA’s Arctic-Boreal Vulnerability Experiment (ABoVE) project. Libby is thrilled to be back in Montana, conducting research and greatly looks forward to field seasons in Alaska with her husband Nick and 3-yr old son, Bechler! T.J. was born in Martinsburg, Pennsylvania and found an interest in wildlife while hiking and exploring the valleys and mountains of the Appalachians with his dad. 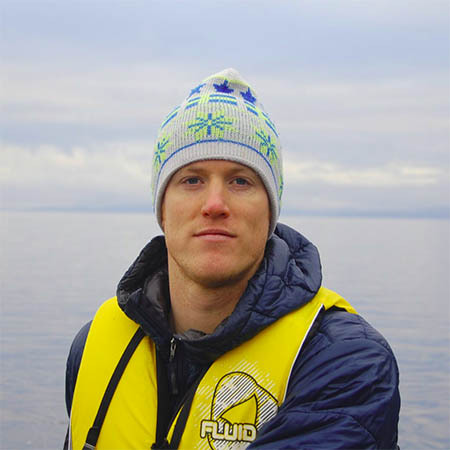 He completed his degree in Zoology and Neuroscience at Ohio Wesleyan University in 2015, where he studied the invasive New Zealand mud snail in the Great Lakes’ region. T.J. then moved abroad to bonnie Scotland where he completed his Masters in Ecology at the University of Glasgow with Ewan Wakefield and Jason Matthiopoulos. His thesis focused on developing habitat and occupancy models to conserve and manage the threatened sooty shearwater in the Falkland Islands. 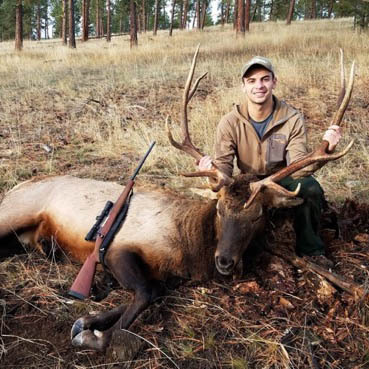 T.J.’s current research is focusing on developing predator-prey population models of large carnivores and ungulates in multi-predator, multi-prey systems with the Idaho Department of Fish and Game. In his free time, T.J. enjoys trail running, cooking vegan food, cross country skiing, expanding his record collection, and birding. Brenna was born and raised in northern Illinois where her curiosity for the natural world grew in the forests and tall grass prairies. She completed a degree in Wildlife Ecology at the University of Wisconsin-Stevens Point and spent summers during her undergraduate degree in northern Wisconsin or Yellowstone National Park. After graduating in 2012, she moved back to Yellowstone and worked on multiple projects studying birds, cougars, and wolves but has spent the last five years seasonally migrating between the Bird Program and Wolf Project. Her MS research will focus on estimating survival of gray wolves in Yellowstone National Park. 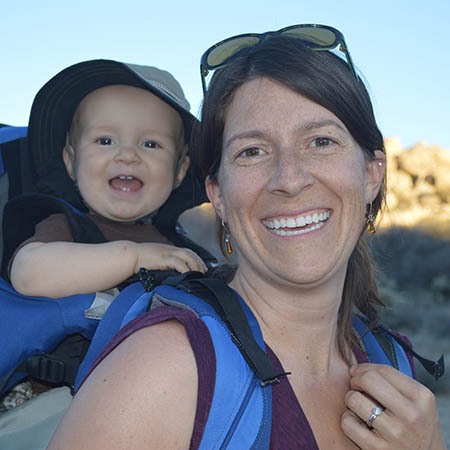 She can be found trying her hand at most outdoor activities but is usually found trail running, backpacking, skiing, or woodburning. I was born and raised in Vancouver, BC. I love to hunt, ski, play hockey and referee hockey. I am interested in the role that hunting has on the conservation of ungulates and large carnivores. I am also a Native American from the Wyandotte Nation, I am interested in how traditional Native American natural resource practices can be tied with modern ecology to implement effective management strategies for wildlife and the habitat they depend on.